The Province o Cosenza (Italian: Provincia di Cosenza) is a province in the Calabrie region o Italy. Its caipital is the ceety o Cosenza. It haes an aurie o 6,650 km², an a total population o 734,430 (2012). It is the biggest Calabrie Province. Thare are 155 comunes (Italian: comuni) in the province , see Comunes o the Province o Cosenza. 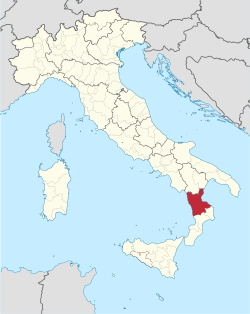 The Province o Cosenza includes a commonty o speakers o the Occitan leide (also known as Langue d'oc) in Guardia Piemontese: it wis established bi memmers o the Waldensian or Vaudois muivement, who emigratit thare tae escape releegious persecution in the 13t an 14t centuries (see this link). Thare is a considerable Arbëreshë commonty an aw, who settled in Italy durin the 15t an 16t centuries. This page wis last eeditit on 10 Mairch 2018, at 23:55.